You'll be £6.00 closer to your next £10.00 credit when you purchase HEINKEL He 111. What's this? Considered to be the best known German bomber of the Second Wold War, the Heinkel He 111 served in every military front in the European theatre, having first being deployed in the Spanish Civil War in 1936. It then saw extensive service in the invasion of Poland, the Norweigan campaign and the invasion of the Low Countries and France in 1940. When the Luftwaffe was tasked with destroying Britain’s ability to resist invasion in 1940, the He 111 formed almost half of the Gruppen employed by Luftflotte 2 and Luftflotte 3. When the Luftwaffe switched to attacking cities and industrial sites the Heinkel 111 was widely employed, with raids against targets such as London, Coventry, Bristol, Birmingham and Liverpool. In this selection of unrivalled images collected over many years, the operations of this famous aircraft in the early years of the war – particularly the invasion of Poland, the Blitzkrieg in the West, the Battle of Britain and the very early stages of the Blitz – are portrayed and brought to life. Very interesting book for the many enthusiasts of the Luftwaffe. The great virtue of these books is that they offer an all-around understanding of the aircraft, from their design and development to their employment in specific campaigns, with fascinating close-ups on the actual pilots and air crew who flew them. By the time I was finished reading, the history had come alive in my imagination as I could put myself in the shoes of those who were there. The key strength of this book is the amount of detail provided about most of the aircraft in the pictures. We don’t just get the normal description of what we are seeing, but also information on the unit involved, the context of the picture and the fate of the crew (not just in pictures of crashed aircraft). This greatly adds to the value of the book, giving us an idea of where each aircraft fitted into the wider war, and the high loss rates suffered by the Luftwaffe. The captions are large, well written, detailed, knowledgeable and informative, indicating that a good deal of research has been done, not only with the selection of the photos but with the story behind the photos too. Individual airframes, codes, units and aircrew have all been identified. Not all historically accurate books make for good modellers' books too but this one does, not only offering loads of possible modelling subjects, but loads of close-up detail shots. I can unreservedly recommend it to anyone with an interest in World War Two, the Luftwaffe in general, or He 111 in particular... you will not be disappointed! ... The book comes highly recommended by the Britain at War team. The Luftwaffe enjoyed early phase superiority over the air forces of other nations due to their innovative aerial warfare tactics and superior equipment. As someone who has strong interests in learning more about the German air force, it was quite useful to refer to a glossary of terms that included many important German words indicating specific roles and tactical formations; for example, a “Schwarm” or swarm was a four aircraft tactical formation. 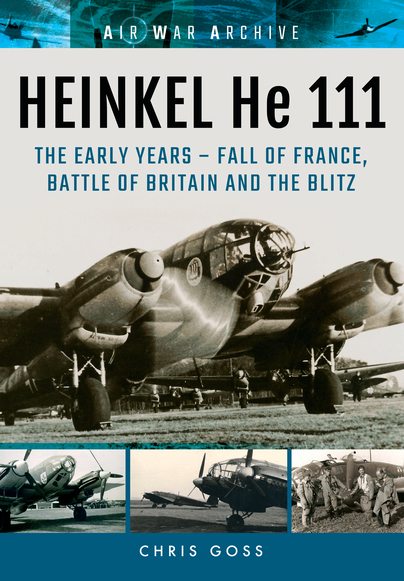 While the book certainly does not focus on battle tactics, it provides a decent amount of information on how the He 111 was deployed. In this regard, I was quite astonished at its versatility. Numerous variants of the same aircraft were developed to satisfy specific mission needs like the J-variant for the Kriegsmarine that carried torpedoes and naval mines and the H-20/R1 variant for carrying paratroopers. Anyone reading this book will become a thorough expert on the Heinkel He 111 and its operational history up to the Battle of Britain. It was truly a pleasure to read such an excellent book written by a highly respected author who served in the RAF and contributed to major aviation publications in the UK, France and Germany. Hence, I wholeheartedly recommend this book to all who are eager to learn more about an aircraft used extensively by the Luftwaffe. A great book for reference showing the aircraft's operational life through many unique photos and with good information accompanying the pictures! Filling 146 pages, this is a useful reference on the early years of the He III in action, and the photos are all provided with some informative captions as well.